The Smoky Bear Lodge sleeps up to 18 folks making it perfect for large families, reunions, church & youth groups, weddings, receptions and corporate retreats near Gatlinburg, Pigeon Forge and Dollywood. 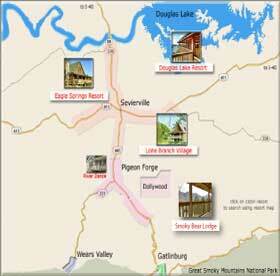 If you are looking for perfection in Pigeon Forge / Gatlinburg accommodations, look no further. This custom built three story lodge with separate guest cottage has every amenity to satisfy even the most discriminating taste. Each level is an adventure in it's self. The main floor is the entry to the living room which boasts a beautiful wood burning fireplace, leather couch and a big screen TV. Cooking couldn't be easier in the fully equipped kitchen... complete with an island counter and a spacious dining room. Get lost in luxury in the master suite which offers the ultimate in romantic views from a large bay window while enjoying the king sized bed, rustic log furniture, TV, and the private bath with Jacuzzi tub. The downstairs is home to the magnificent game room with its stone fireplace and pool table. Perfect for that friendly game of pool, relaxing, socializing and getting lost in conversation.